Our volunteer management module simplifies and centralizes all the aspects of managing volunteers for an event, from collection of personal information and scheduling preferences, to managing uniform distribution and the actual scheduling process. It integrates tightly with other modules, allowing for easy credential printing and automatic population of a searchable volunteer directory. Our system has been designed to be simple and intuitive for both novice and experienced computer users. We regularly request and make use of feedback to ensure that first time and returning volunteers have the best experience possible. Event staff, volunteers and volunteer chairs are encouraged to communicate with Cueto & Cueto staff members. Whether it's requesting help, reporting a bug or request a feature, our support is as much a part of the package as the software. Almost everything you see can be tailored to your event or committee's needs. From multiple committee assignments and subcommittees, to committee-specific work days and availability modes, we believe the system should change to meet your needs and not the other way around. When a volunteer first signs up, the system guides them through collecting personal information, committee choices, uniform choices, schedule availability and, if applicable, paying the volunteer fee, through check or credit card. Special help links, which point to a printable Quick Start Guide, are visible throughout the entire process. A variety of tools and methods for one- and two-way communication and automatic alerts between staff, volunteers and the management system ensure a constant flow of information. Information entered into the system automatically becomes part of the event directory, allowing chairs and staff easy access to printable committee address books containing phone and other contact information. The free-form export tool allows you to define the quantity, criteria and order of export data, so generating a mail merge or phone directory file is nearly effortless. The export file is compatible with any major office suite, e-mail program and contact management system. All users can take advantage of on- and off-site messaging to stay in touch, while certain types of accounts have extra permissions. For example, a chairperson can send broadcast message and e-mail blasts to their committees while staff can do the same on an event-wide basis. Chairpersons and event staff can post volunteer news and updates, targeted at specific committees or the entire volunteer group. Volunteers and chairpersons can respectively see and post updates for their assigned committees, whereas event staff have global control. Committee members and staff can discuss news items with a built-in message board for each post. 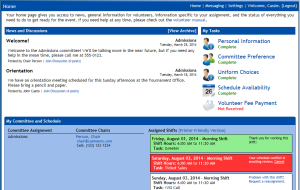 In addition to the many communication options and tools dedicated to scheduling and uniform distribution, the system contains over a dozen other management tools designed to give you control over various aspects of volunteer management. Chairperson accounts have access to a special set of management tools for their assigned committees, including a customized "My Committees" overview with membership and messaging options, a powerful manual scheduling and schedule printing tool, news posting tools, and multiple reporting options. 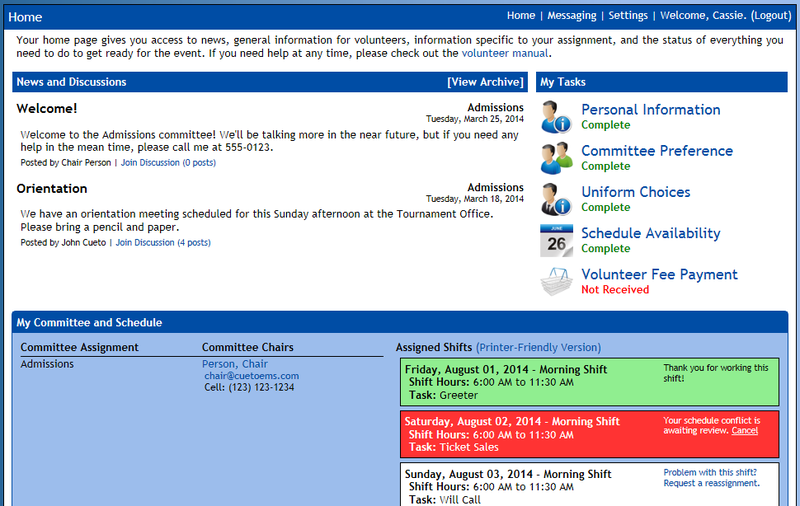 The committee management tools let you control all aspects of your volunteer committees including: volunteer assignments, display name, description visible to volunteers, conditions (such as periods of standing) visible to volunteers, volunteer tasks and locations, and scheduling options, such as shift quotas. Ensure that problem volunteers don't get invited back. If a newly registered volunteer matches one of the specified criteria, the user will be flagged and eligible for deletion on many of the administrative pages. Have an old volunteer management system, database or spreadsheet and don't want to lose all that data? The Import Users tool can process exports from most other platforms and if it can't - we'll help you move your old data over ourselves. Access almost twenty pre-made reports, from committee counts and an exportable uniform order to volunteer medical concerns and incomplete volunteer tasks. Many reports have interactive criteria and allow you to directly message any matching volunteers or committees. Simplify uniform distribution by taking advantage of several tools. Staff can set up an unlimited number of groups and individual uniform items. Volunteers can use the uniform preferences page to select item, size and color preferences for all available choices. Finally, the uniform distribution tool allows you to quickly find and fill orders in person, with a search by last name and the click of a button. Perhaps the most important part of the volunteer management package, the schedule portion of the program lets staff and volunteer chairs quickly create and distribute work schedules. In addition to the expected scheduling tools, we've added a variety of feaures to enhance the process. The system can take advantage of volunteer availability and shift quotas to make a rough scheduling pass which volunteer chairs or event staff can fine tune at a later date. The rough pass uses a fairness algorithm to make sure that all volunteers are assigned to a similar number of shifts. This printer-friendly, color-coded report gives you a by-committee view of volunteer availability and assignments to quickly identify schedule problems and gaps in coverage. The volunteer home page gives one-click access to an availability form and always displays the most up-to-date version of a volunteer's schedule. From that schedule, volunteers can be notified or thanked upon completing a shift and can flag potential schedule problems for later review. A volunteer's first visit is simple and inviting. A volunteer's home page acts as a portal to the event. The chairperson home page provides access to a wide variety of information and tools. News discussions have a familiar message-board feel. The uniform distribution tools make short work of long lines and complicated orders. The automatic scheduler eliminates hours of work with a few clicks of the mouse.